The Interest in sabotage in the United States has developed lately on account of the cage of Frederic Sumner Boyd in the state of New- Jersey, as an aftermath of the Paterson strike. Before his arrest and conviction for advocating sabotage, little or nothing was known of this particular form of labor tactic in the United States. Now there has developed a two-fold necessity to advocate it: not only to explain what it means to the worker in his fight for better conditions, but also to justify our fellow- worker Boyd in every thing that he said. So I am desirous primarily to explain sabotage, to explain it in this two-fold significance, first as to its utility and second as to its legality. I am not going to attempt to justify sabotage on any moral ground. If the workers consider that sabotage is necessary, that in itself makes sabotage moral. Its necessity is its excuse for existence. And for us to discuss the morality of sabotage would be as absurd as to discuss the morality of the strike or the morality of the class struggle itself. In order to understand sabotage or to accept it at all it is necessary to accept the concept of the class struggle. If you believe that between the workers on the one side and their employers on the other there is peace, there is harmony such as exists between brothers, and that consequently whatever strikes and lockouts occur are simply family squabbles; if you believe that a point can be reached whereby the employer can get enough and the worker can get enough, a point of amicable adjustment of industrial warfare and economic distribution, then there is no justification and no explanation of sabotage intelligible to you. Sabotage is one weapon in the arsenal of labor to fight its side of the class struggle. Labor realizes, as it becomes more intelligent, that it must have power in order to accomplish anything; that neither appeals for sympathy nor abstract rights will make for better conditions. for instance, take an industrial establishment such as a silk mill where men and women and little children work ten hours a day for an average wage of between six and seven dollars a week. Could any one of them, or a committee representing the whole, hope to induce the employer to give better conditions by appealing to his sympathy, by telling him of the misery, the hardship and the poverty of their lives; or could they do it by appealing to his sense of justice? Suppose that an individual working man or woman went to an employer and said: “I make, in my capacity as wage worker in this factory, so many dollars worth of wealth every day and justice demands that you give me at least half” The employer would probably have him removed to the nearest lunatic asylum, He would consider him too dangerous a criminal to let loose on the community! It is neither sympathy nor justice that makes an appeal to the employer. But it is power. If a committee can go to the employer with this ultimatum: “‘We represent all the men and woman in this shop. They are organized in, a union as you are organized in manufacturers’ association. They have met and formulated in that union a demand for better hours and wages and they are not going to work one day longer unless they get it. In other words, they have withdrawn their power as wealth producers from your plant and they are going to coerce you by this withdrawal of their power; into granting their demands’” that sort of ultimatum served upon an employer usually meets with an entirely different response: and if the union is strongly enough organized and they are able to make good their threat they usually accomplish what tears and pleadings never could have accomplished. We believe that the class struggle existing in society is expressed in the economic power of the master on the one side and the growing economic power of the workers on the other side meeting in open battle now and again, but meeting in continual daily conflict over which shall have the larger share of labor’s product and the ultimate ownership of the means of life. The employer wants long hours, the intelligent workingman wants short hours. The employer wants low wages, the intelligent workingman wants high wages. The employer is not concerned with the sanitary conditions in the mill, he is concerned only with keeping the cost of production at a minimum; the intelligent workingman is concerned, cost or no cost, with having ventilation, sanitation and lighting that will be conducive to his physical welfare. Sabotage is to the class struggle what guerrilla warfare is to the battle. The strike is the open battle of the class struggle, sabotage is the guerrilla warfare, the day-by-day warfare between two opposing classes. Sabotage was adopted by the General Federation of Labor of France in 1897 as a recognized weapon in their method of conducting fights on their employers. But sabotage as an instinctive defence existed long before it was ever officially recognized by any labor organization. Sabotage means primarily: the withdrawal of efficiency. Sabotage means either to slacken up and interfere with the quantity, or to botch in your skill and interfere with the quality, of capitalist production or to give poor service. Sabotage is not physical violence, sabotage is an internal, industrial process. It is someething that is fought out within the four walls of the shop: And these three forms of sabotage - to affect the quality, the quantity and the service are aimed at effecting the profit the employer. Sabotage is a means of striking at the employers profit for the purpose of forcing him into granting certain conditions, even as workingmen strike for the same purpose of coercing him. It is simply another from of coercion. There are many forms of interfering with efficiency, interfering with quality and the quantity of production: from varying motives - there is the employer’s sabotage as wall as the worker’s sabotage. Employers interfere with the quality of production, they interfere with the quantity of production, they interfere with the supply as well as with the kind of goods for the purpose of increasing their profit. But this form of sabotage, capitalist sabotage, is antisocial, for the reason that it is aimed at the good of the few at the expense of the many, whereas working-class sabotage is distinctly social, it is aimed at the benefit of the many, at the expense of the few. Working-class sabotage is aimed directly at “the boss” and at his profits, in the belief that that is his religion, his sentiment, his patriotism. Everything is centered in his pocket book, and if you strike that you are striking at the most vulnerable point in his entire moral and economic system. Sabotage as it aims at the quantity is a very old thing, called by the Scotch “ca canny” All intelligent workers have tried it at some time or other when they have been compelled to work too hard and too long. The Scotch dockers had a strike in 1889 and their strike was lost, but when they went back to work they sent a circular to every docker in Scotland and in this circular they embodied their conclusions, their experience from the bitter defeat. It was to this effect. “The employers like the scabs, they have always praised their work, they have said how much superior they were to us, they have paid them twice as much as they have ever paid us: now lot us go back on the docks determined that since those are the kind of workers, they like and that is the kind of work they endorse we will do the same thing. We will let the kegs of wine go over the docks as the scabs did. We will have great boxes of fragile articles drop in the midst of the pier as the scabs did. We will do the work just as clumsily, as slowly, as destructively, as the scabs did. And we will see how long our employers can stand that kind of work.” It was very few months until through this system of sabotage they had won everything they had fought for and not been able to win through the strike. This was the first open announcement of sabotage in an English-speaking country. I have heard of my grandfather telling how an old fellow come to work on the railroad and the boss said, “Well, what can you do?”. “I can do most anything” said he - a big husky fellow. “Me no understan’ English”- none of them wished to talk. That, too, is an illustration of the form of sabotage that I am now describing to you, the “ca canny” form of sabotage, the” go easy” slogan, the “slacken up, don ‘t work so hard” species, and it is a reversal of the motto of the American Federatian of Labor, that most “safe, sane and conservative” organization of labor in America. They believe in “a fair day’s wage for a fair days work.” Sabotage is an unfair day’s work for an unfair day’s wage. It is an attempt on the part of the worker to limit his production in proportion to his remuneration. That is one form of sabotage. The second form of sabotage is to deliberately interfere with the quality of the goods. And in this we learn many lessons from our employers, even as we learn how to limit the quantity. You know that every year in the western part of this United States there are fruits and grains produced that never find a market; bananas and oranges rot on the ground, whole skiffs of fruits are dumped into the ocean. Not because people do not need these foods and couldn’t make good use of them in the big cities of the east, but because the employing class prefer to destroy a large percentage of the production in order to keep the price up in cities like New York, Chicago, Baltimore and Boston. If they sent all the bananas that they produce into the eastern part of the United States we would be buying bananas at probably three for a cent. But by destroying a large quantity, they are able to keep the price up to two for 5c. And this applies to potatoes, apples, and very many other staple articles required by the majority of people. Yet if the worker attempts to apply the same principle, the same theory, the same tactic as his employer we are confronted with all shorts of finespun moral objections. So it is with the quality. Take the case of Frederic Sumner Boyd, in which we should all be deeply interested because it is evident Frederic Sumner Boyd is to be made” the goat” by the authorities in New Jersey. That is to say, they want blood, they want one victim. If the y can’t get anybody else they are determined they are going to get Boyd, in order to serve a two-fold purpose to cow the workers of Paterson, as they believe they can, and to put this thing, sabotage, into the statutes, to make it an illegal thing to advocate or to practice. Boyd said this: “If you go back to work and you find scabs working alongside of you, you should put a little bit of vinegar on the reed of the loom in order to prevent its operation.” They have arrested him under the statute forbidding the advocacy of the destruction of property. He advised the dyers to go into the dye houses and to use certain chemicals in the dyeing of the silk that would tend to make that silk unweavable. That sounded very terrible in the newspapers and very terrible in the court of law. But what neither the newspapers nor the courts of law have taken any cognizance of is that these chemicals are being used already in the dyeing of the silk. It is not a new thing that Boyd is advocating, it is something that is being practiced in every dye house in the city of Paterson already but it is being practiced for the employer and not for the worker. Let me give you a specific illustration of what I mean. Seventy-five years ago when silk was woven into cloth the silk skein was taken in the pure, dyed and woven, and when that piece of silk was made it would last for 50 years. Your grandmother could wear it as a wedding dress. Your mother could wear it as a wedding dress. And then you, if you, woman reader, were fortunate enough to have a chance to get married, could wear it as a wedding dress also. But the silk that yon buy today is not dyed in the pure and woven in to a strong and durable product. One pound of silk goes into the dye house and usually as many as three to fifteen pounds come out. That is to say, along with the dyeing there is an extraneous and an unnecessary process of what is very picturesquely called “dynamiting.” They weight the silk. They have solutions of till, solutions of zinc, solutions of lead. If you will read the journals of the Silk Association of America you will find in there advice to master dyers as to which salts are the most appropriate for weighting purposes. You will read advertisements - possibly you saw it reprinted in “The Masses” for December, 1913 - of silk mills, Ashley & Bailey’s in Paterson, for instance, advertised by an auctioneer as having a plant for weighting, for dynamiting silk par exellence. And so when you buy a nice piece of silk today and have a dress made for festive occasions, you hang it away in the wardrobe and when you take it out it is cracked down the pleats and along the waist and arms. And you believe that you have been terribly cheated by a clerk. What is actually wrong is that you have paid for silk where you have received old tin cans and zinc and lead and things of that sort. You have a dress that is garnished with silk, seasoned with silk, but a dress that is adulterated to the point where, if it was adulterated just the slightest degree more it would fall to pieces entirely. Now, Boyd’s form of sabotage was not the most dangerous form of sabotage at that. If the judges had any imagination they would know that Boyd’s form of sabotage was pretty mild compared with this: Suppose that he had said to the dyers in Paterson, to a sufficient number of them that they could do it as a whole, so that it would affect every dye house in Paterson: “Instead of introducing these chemicals for adulteration, don ‘t introduce them at all. Take the lead, the zinc, and the till and throw it down the sewer and weave the silk, beautiful, pure, durable silk just as it is. Dye it pound, for pound hundred pound for hundred pound.” The employers would have been more hurt by that form of sabotage than by what Boyd advocated. And they would probably have wanted him put in jail for life instead of for seven years. In other words, to advocate non adulteration is a lot more dangerous to capitalist interests than to advocate adulteration. And nonadulteration is the highest form of sabotage in all establishments like the dye house of Paterson, bakeries, confectioners, meat packing houses, restaurants, etc. Interfering with quality, or durability, or the utility of a product, might be illustrated as follows: Suppose a milkman comes to your house every day and delivers a quart of milk and this quart of milk is half water and they put some chalk in it and some glue to thicken it. Then a milk driver goes on that round who belongs to a union. The union strikes. And they don’t win any better conditions. Then they turn on the water faucet and they let it run so that the mixture is four-fifths water and one-fifth milk. You will send the “milk” back and make a complaint. At the same time that you are making that complaint and refusing to use the milk, hundreds and thousands of others will do the same thing, and through striking at the interests of the consumer once they are able to effect better conditions for themselves and also they are able to compel the employers to give the pure product. That form of sabotage is distinctly beneficial to the consumer. Any exposure of adulteration, any over-adulteration that makes the product unconsumable is a lot more beneficial to the consumer than to have it tinctured and doctored so that you can use it but so that it is destructive to your physical condition at the same time. Interfering with quality can be in instanced in the hotel and restaurant kitchens. I remember during the hotel workers strike they used to tell us about the great cauldrons of soup that stood there month in and month out without ever being cleaned, that were covered with verdigris and with various other forms of animal growth, and that very many times into this soup would fall a mouse or a rat and he would be fished out and thrown aside and the soup would be used just the same. Now, can anyone say that if the workers in those restaurants, as a means of striking at their employers, would take half a pound of salt and throw it into that soup cauldron, you as a diner, or consumer, wouldn’t be a lot better of? It would be far better to have that soup made unfit for consumption than to have it left in a state where it can be consumed but where it is continually poisonous to a greater or less degree. Destroying the utility of the goods sometimes means a distinct benefit to the person who might otherwise use the goods. But that form of sabotage is not the final form of sabotage. Service can be destroyed as well as quality. And this accomplished in Europe by what is known as “the open mouth sabotage.” In the hotel and restaurant industry, for instance - I wonder if this judge who sentenced Boyd to seven years in state’s prison would believe in this form of sabotage or not? Suppose he went into a restaurant and ordered a lobster salad and he said to the spick and svan waiter standing behind the chair, “Is the lobster salad good?” “Oh, yes, sir,” said the waiter, “It is the very best in the city.” That would be acting the good wage slave and looking out for the employers interest. But if the waiter should say, “No, sir, it’s rotten lobster salad. It’s made from the pieces that have been gathered together here for the last six weeks,” that would be the waiter who believed in sabotage, that would be the waiter who had no interest in his boss’ profits, the waiter who didn’t give a continental whether the boss sold lobster salad or not. And the judge would probably believe in sabotage in that particular instance. The waiters in the city of New York were only about 5,000 strong. Of these, about a thousand were militant, were the kind that could be depended on in a strike. And jet that little strike made more sensation in New York City than 200,000 garment workers who were out at the same time. They didn’t win very much for themselves, because of their small numbers, but they did win a good deal in demonstrating their power to the employer to hurt his business. For instance, they drew up affidavits and they told about every hotel and restaurant in New York, the kitchen and the pantry conditions. They told about how the butter on the little butter plates was sent back to the kitchen and somebody with their fingers picked out cigar ashes and the cigarette butts and the matches and threw the butter back into the general supply. They told how the napkins that bad been on the table, used possibly by a man who had consumption or syphilis, were used to wipe the dishes in the pantry. They told stories that would make your stomach sick and your hair almost turn white ,of conditions in the Waldorf, the Astor, the Belmont, all the great restaurants and hotels in New York. And I found that that was one of the most effective ways of reaching the public, because the “dear public” are never reached through sympathy. I was taken by a lady up to a West Side aristocratic club of women who had nothing else to do, so they organized this club. You know - the white-gloved aristocracy! And I was asked to talk about the hotel workers’ strike. I knew that wasn’t what they wanted at all. They just wanted to look at what kind of person a “labor agitator” was. But I saw a chance for publicity for the strikers. I told them about the long hours in the hot kitchens; about steaming, smoking ranges. I told them about the overwork and the underpay of the waiters and how these waiters had to depend upon the generosity or the drunkenness of some patron to give them a big tip; all that sort of thing. And they were stony-faced. It affected them as much as an arrow would Gibraltar. And then I started to tell them about what the waiters and the cooks had told me of the kitchen conditions and I saw a look of frozen horror on their faces immediately. They were interested when I began to talk about something that affected their own stomach. Where I never could have reached them through any appeal for humanitarian purposes. Immediately they began to draw up resolutions and to cancel engagements at these big hotels and decided that their clubs must not meet there again. They caused quite a commotion around some of the big hotels in New York. When the workers went back to work after learning that this was a way of getting at the boss via the public stomach they did not hesitate at sabotage in the kitchens. If any of you have ever got soup that was not fit to eat, that was too salty or peppery, maybe shorter hours, and that was one way they notified there where some boys in the kitchen that wanted the boss. In the Hotel McAlpin the head waiter called the men up before him after the strike was over and lost and said, “Boys, you can have what you want, we will give you the hours, we will give you the wages, we will give you everything, but, for God ’s sake, stop this sabotage business in the kitchen!” In other words, what they had not been able to win through the strike they were able to win by striking at the taste of the public, by making the food non-consumable and therefore compelling the boss to take cognizance of their efficiency and their power in the kitchen. Interfering with service may be done in another way. It may be done, strange to say, some times by abiding by the rules, living up to the law absolutely. Sometimes the law is almost as inconvenient a thing for the capitalist as for a labor agitator. For instance, on every railroad they have a book of rules, a nice little book that they give to every employee, and in that book of rules it tells how the engineer and the fireman must examin every part of the engine before they take it out It tells how the brakeman should go the length and the width of the train and examine every bit of machinery to be sure it’s in good shape. It tells how the stationmaster should do this and the telegraph operator that, and so forth, and it all sounds very nice in the little book. But now take the book of rules and compare it with the time table and you will realize how absolutely impossible the whole thing is. What is it written for? An accident happens. An engineer who has been working 36 hours does not see a signal on the track, and many people are killed. The coroner’s jury meets to fix the responsibility. And up on whom is it fixed? This poor engineer who didn’t abide by the book of rules! He is the man upon whom the responsibility falls. The company wire their hands and say ‘We are not responsible. Our employee was negligent. Here are our rules.” And through this book of rules they are able to fix the responsibility of every accident on some poor devil like that engineer who said the other day, after a frightful accident, when he was arrested, “Yes, but if I didn’t get the train in at a certain time I might have lost my job under the new management on the New Haven road.” That book of rules exists in Europe as well. In one station in France there was an accident and the station master was organized in the Railwaymen’s Union. And they went to the union and asked for some action. The union said, “The best thing for you men to do is to go back on the job and obey that book of rules letter for letter. If that is the only reason why accidents happen we will have no accidents hereafter.” So they went back and when a man came up to the ticket office and asked for a ticket to such and such a place, the charge being so much and would hand in more than the amount he would be told, can’t give you any change. It says in the book of rules a passenger must have the exact fare.” This was the first one. Well, after a lot of fuss they chased around and got the exact change, were given their tickets and got aboard the train. Then when the train was supposedly ready to start the engineer climbed down, the fireman followed and they began to examine every holt and piece of mechanism on the engine. The brakeman got off and began to examine every thing he was supposed to examine. The passengers grew very restless. The train stood there about an hour and a half. They proceeded to leave the train. They were met at the door by an employee who said, “No, it’s against the rules for you to leave the train once you get into it, until you arrive at your destination.” And within three days the railroad system of France was so completely demoralized that they had to exonerate this particular station master, and the absurdity of the book of rules had been so demonstrated to the public that they had to make over their system of operation before the public would trust themselves to the railroads any further. This book of rules has been tried not only for the purpose of exoneration: it has been tried for the purpose of strikes. Where men fail in the open battle they go back and with this system they win. Railroad men can sabotage for others as well as for themselves. In a case like the miners of Colorado where we read there that militiamen were sent in against the miners. We know that they are sent against the miners because the first act of the militia was to disarm the miners and leave the mine guards, the thugs, in possession of their arms. Ludlow followed! The good judge O’Brien went into Calumet, Mich., and said to the miners - and the president of the union, Mr. Moyer, sits at the table as chairman white he said it - “Boys, give up your guns. It is better for you to be shot than it is to shoot anybody.” Now, sabotage is not violence, but that does not mean that I am deprecating all forms of violence. I believe for instance in the case of Michigan, in the case of Colorado, in the cage of Roosevelt, N. J., the miners should have held onto their guns, exercised their “constitutional right” to bear arms, and, militia or no militia, absolutely refused to give them up until they saw the guns of the thugs and the guns of the mine guards on the other side of the road first. And even then it might be a good precaution to hold on them in cage of danger! Well, when this militia was being sent from Denver up into the mining district one little train crew did what has never been done in America before; something that caused a thrill to go through the humblest toiler. If I could have worked for twenty years just to see one little torch of hope like that, I believe it worth while. The train was full of soldiers. The engineer, the fireman, all the train crew stepped out of the train and they said, “We are not going to run this train to carry any soldiers in against our brother strikers.” So they deserted the train, but it was then operated by a Baldwin detective and a deputy sheriff. Can you say that wasn’t a case where sabotage was absolutely necessary? Suppose that when the engineer had gone on strike he had taken a vital part of the engine on strike with him, without which it would have been impossible for anyone to run that engine. Then there might have been a different story. Railroad men have a mighty power in refusing to transport soldiers, strike-breakers and ammunition for soldiers and strike-breakers into strike districts. They did in Italy. The soldiers went on the train. The train guards refused to run the trains. The soldiers thought they could run the train themselves. They started, and the first signal they came to was “Danger”. They went along very slowly and cautiously, and the next signal was at “Danger”. And they found before they had gone very far that some of the switches had been turned and they were run off on to a siding in the woods somewhere. Laboriously they got back onto the main track. They came to a drawbridge and the bridge was turned open. They had to go across in boats and abandon the train. That meant walking the rest of the way. By the time they got into the strike district the strike was over. Soldiers who have had to walk aren’t so full of yim and vigor and so anxious to shoot “dagoes” down when they get into a strike district as when they ride in a train manned by union men. The railroad men have mighty power in refusing to run these trains and putting them in such a condition that they can’t be run by others. How ever, to anticipate a question that is going to be asked about the possible disregard for human life. Remember that when they put all the signals at danger there is very little risk for human life, because the train usually has to stop dead still. Where they take a vital part of the engine away the train does not run at all. So human life is not in danger. They make it a practice to strike such a vital blow that the service is paralyzed thereafter. But other printers have accomplished the same results by the sabotage. In Copenhagen once there was a peace conference and a circus going on at the same time. The printers asked for more wages and they didn’t get them. They were very sore. Bitterness in the heart is a very good stimulus for sabotage. So they said, “All right, we will stay right at work boys, but we will do some funny business with this paper so they won’t want to print it tomorrow under the same circumstances.” They took the peace conference where some high and mighty person was going to make an address on international peace and they put that man’s speech in the circus news; they reported the lion and the monkey as a making speeches in the peace conference and the Honorable Mr. Soand-so doing trapeze arts in the circus. There was great consternation and indignation in the city. Advertisers, the peace conference, the circus protested. The circus would not pay their bill for advertising. It cost the paper as much, eventually, as the increased wages would have cost them, so that they came to the men figuratively on their bended knees and asked them, “Please be good and we will give you what ever you ask.” That is the power of interfering with industrial efficiency by a competent worker. Sabotage is for the workingman an absolute necessity. Therefore it is almost useless to argue about its effectiveness. When men do a thing instinctively continually, year after year and generation after generation, it means that that weapon has some value to them. 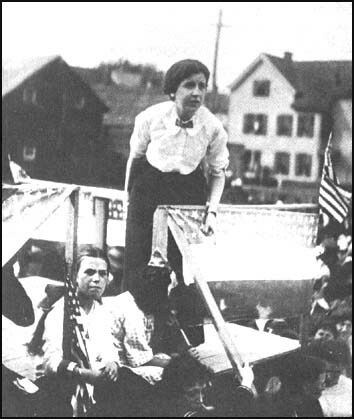 When the Boyd speech was made in Paterson, immediately some of the socialists rushed to the newspapers to protest. They called the attention of the authorities to the fact that the speech was made. The secretary of the socialist party and the organizer of the socialist party repudiated Boyd. That precipitated the discussion into the strike committee as to whether speeches on sabotage were to be permitted. We had tried to install into the strikers the idea that any kind of speech was to be permitted; that a socialist or a minister or a priest; an I.W.W. man, an anarchist, anybody should have the platform. And we tried to make the strikers realize. “You have sufficient intelligence to select for yourselves. If you haven’t got that, then no censorship over your meetings is going to do you any good.” So they had a rather tolerant spirit and they were not inclined to accept this socialist denunciation of sabotage right off the ree1. They had an executive session and threshed it out and this is what occured. As we went down the line, one member of the executive committee after another admitted they had used this thing but they “didn’t know that was what you called it!” And so in the end democrats, republicans, socialists, all I. W. W.’s in the committee voted that speeches on sabotage were to be permitted, because it was ridiculous not to say on the platform what they were already doing in the shop. And so my final justification of sabotage is its constant use by the worker. The position of speakers, organizers, lecturers, writers who are presumed to be interested in the labor movement, must be one of two. If you place yourself in a position outside of the working class and you presume to dictate to them from some “superior” intellectual plane, what they are to do, they will very soon get rid of you, for you will very soon demonstrate that you are of absolutely no use to them. I believe the mission of the intelligent propagandist is this: we are to see what the workers are doing, and then try to understand why they do it; not tell them its right or its wrong, but analyze the condition and see if possibly they do not best understand their need and if, out of the condition, there may develop a theory that will be of general utility. Industrial unionism, sabotage are theories born of such facts and experiences. But for us to place ourselves in a position of censorship is to alienate ourselves entirely from sympathy and utility with the very people we are supposed to serve. Sabotage is objected to on the ground that it destroys the moral fiber of the individual, what ever that is! The moral fiber of the workingman! Here is a poor workingman, works twelve hours a day seven days a week for two dollars a day in the steel mills of Pittsburg. For that man to use sabotage is going to destroy his moral fiber. WeIl, if it does, then moral fiber is the only thing he has left. In a stage of society where men produce a completed article, for instance if a shoemaker takes a piece of raw leather, cuts it, designs it, plans the shoes makes every part of the shoes, turns out a finished product, that represents to him what the piece of sculpturing represents to the artist, there is joy in handicraftsmanship, there is joy in labor. But can anyone believe that a shoe factory worker, one of a hundred men, each doing a small part of the complete whole, standing before a machine for instance and listening to this ticktack all day long-that such a man has any joy in his work or any pride in the ultimate product? The silk worker for instance may make beautiful things, fine shimmering silk. When it is hung up in the window of Altman’s or Macy’s or Wanamaker’s it looks beautiful. But the silk worker never gets a chance to use a single yard of it. And the producing of the beautiful thing instead of being a pleasure is instead a constant aggravation to the silk worker. They make a beautiful thing in the shop and then they come homo to poverty, misery, and hardship. They wear a cotton dress while they are weaving the beautiful silk for some demi monde in New York to wear. The only time they get a silk dress is when they spoil the goods so that nobody else will use it: when the dress is so ruined that nobody else would want it. Then they can have it. The silk worker take pride in his product! To talk to these people about being proud of their work is just as silly as to talk to the street cleaner about being proud of his work, or to tell the man that scrapes out the sewer to be proud of his work. If they made an article completely or if they made it all together under a democratic association and then they had the disposition of the silk - they could wear some of it, they could make some of the beautiful salmon-colored and the delecate blues into a dress for themselves - there would be pleasure in producing silk. But until you eliminate wage slavery and the exploitation of labor it is ridiculous to talk about destroying the moral fiber of the individual by telling him to destroy “his own product” Destroy his own product! He is destroying somebody else’s enjoyment, somebody else’s chance to use his product created in slavery. There is an other argument to the effect that .. If you use this thing called sabotage you are going to develop in yourself a spirit of hostility, a spirit of antagonism to everybody else in society, you are going to become sneaking, you are going to become cowardly. It is an underhanded thing to do.” But the individual who uses sabotage is not benefiting himself alone. If he were looking out for himself only he would never use sabotage. It would be much easier, much safer not to do it. When a man uses sabotage he is usually intending to benefit the whole; doing an individual thing but doing it for the benefit of himself and others together. And it requires courage. It requires individuality. It creates in that workingman some self-respect for and self-reliance upon himself as a producer. I contend that sabotage instead of being sneaking and cowardly is a courageous thing, is an open thing. The boss may not be notified about it through the papers, but he finds out about it very quietly, just the same. And the man or woman who employs it is demonstrating a courage that you may measure in this way: How many of the critics would do it? How many of you, if you were dependent on a job in a silk town like Paterson, would take your job in your hands and employ sabotage? If you were a machinist in a locomotive shop and had a good job, how many of you would risk it to employ sabotage? Consider that and then you have the right to call the man how uses it a coward – if you can. It is my hope that workers will not only “sabotage” the supply of products, but also the over-supply of producers. In Europe the syndicalists have carried on a propaganda that we are too cowardly to carry on in the United States as yet. It is against the law. Everything is “against the law”, once it becomes large enough for the law to take cognizance that it is in the best interests of the working class. If sabotage is to be thrown aside because it is construed as against the law, how do we know that next year free speech may not have to be thrown aside? Or free assembly and free press? That a thing is against the law, does not mean necessarily that the thing is not good. Sometimes it means just the contrary: a mighty good thing for the working class to use against the capitalists. In Europe they are carrying on this sort of limitation of product: the are saying, “Not only will we limit the product in the factory, but we are going’ to limit the supply of producers. We are going to limit the supply of workers on the market.” Men and women of the working class in France and Italy and even Germany today are saying, “W e are not going to have ten, twelve and fourteen children for the army, the navy, the factory and the mine. We are going to have fewer children, with quality and not quantity accentuated as our ideal who can be better fed, better clothed, better equiped mentally and will become better fighters for the social revolution.” Although it is not a strictly scientific definition I like to include this as indicative of the spirit that produces sabotage. It certainly is one of the most vital forms of class warfare there are, to strike at the roats of the capitalists system by limiting their supply of slaves on their own behalf. The difference is this: when you sabotage an employer you are sabotaging somebody upon whom you are not interdependent, you have no relationship with him as a member of society contributing to your wants in return for your contribution. The employer is somebody who depends absolutely on the workers. Whereas, the miner is one unit in a society where somebody else supplies the bread, somebody else the clothes, somebody else the shoes, and where he gives his product in exchange for someone else’s; and it would be suicidal for him to assume a tyrannical, a monopolistic position, of demanding so much for his product that the others might out him off from any other social relations and refuse to meet with any such bargain. In other words, the miner, the railroad worker, the baker is limited in using sabotage against his fellow workers because he is interdependent on his fellow workers, whereas he is not materially interdependent on the employer for the means of subsistence. But the worker will not be swerved from his stern purpose by puerile objections. To him this is not an argument but a struggle for life. He knows freedom will come only when his class is willing and courageous enough’ to fight for it. He knows the risk, far better than we do. But his choice is between starvation in slavery and starvation in battle. Like a spent swimmer in the sea, who can sink easily and apathetically into eternal sleep, but who struggles on to grasp a stray spar, suffers but hopes in suffering - so the worker makes his choice. His wife’s worries and tears spur him forth to don his shining armor of industrial power; his child’s starry eyes mirror the light of the ideal to him and strengthen his determination to strike the shackles from the wrists of toil before that child enters the arena of industrial life; his manhood demands some rebellion against daily humiliation and intolerable exploitation. To this worker, sabotage is a shining sword. It pierces the nerve centers of capitalism, stabs at its hearts and stomachs, tears at the vitals of its economic system. It is cutting a path to freedom, to ease in production and ease in consumption. ORIGINAL PUBLISHER’S NOTE. - The reference to the case of Friderick Sumner Boyd, which is found in several places in the text of the foregoing pamphlet, requires additional explanation. The pamphlet, was written more than two years ago, since which time some interesting developments have occurred in Boyd ’s case. After being convicted on the charge of “advising the destruction of property” Boyd carried his case to the New Jersey Court of Errors and Appeals, where the lower court was sustained. Boyd was then taken into custody, and sent to the state prison in Trenton a sentence of “from two to seven years.” He immediately signed a petition for pardon in which he professes to have repudiated his former ideas, and to have renounced the advocacy of sabotage an all other subversive ideas. In view of Boyd’s apparent cowardice in the presence of the pamphlet is about to go to press, we add this note for the sake of clearness. Originally published as "Sabotage, the conscious withdrawal of the workers' industrial efficiency" in October, 1916, by the IWW publishing bureau. I corrected the spelling of Elizabeth in the author tag, reduced the number of tags and added the author's name to the title of the article after a hyphen. We often do this with articles, especially if the author is well known, or someone will be likely to search for the text with the author's name. Finally, I cut the intro and put it at the top of the body text, and instead wrote a custom intro explaining very briefly the subject of the article. Please don't let these comments put you off posting in future, we can easily tidy anything up, no problems. No problems giving me those comments. I've forgot all the guidelines. Elizabeth vs. Elisabeth: I just used the spelling that was on polkagris.nu and on iww.org. why i'm in the middle of reading this right now. read her prison book earlier this fall.